It's Christmas Eve in Finland and a US archaeological dig has just uncovered something startling. Buried deep underground, frozen in a huge block of ice, is the real Father Christmas. However, this is not your typical Santa - no this creature is far scarier than that. Far from warm and cuddly - this Santa is a reindeer slaying force to be reckoned with and he is out to punish anyone who has been naughty. When young Pietari (wonderfully portrayed by Onni Tommila) realises that Santa has kidnapped all of the children in his village he knows it is time to take drastic action. Click Here For Movie News, Reviews And Events! I really enjoyed Rare Exports - so much so that it will become a regular Christmas movie for me (alongside Die Hard and Elf). As the film started, Rare Exports reminded me of The Thing. It is just never a good idea to defrost something that has been buried for so long. But we humans never learn do we? The film then introduces us to gorgeous little Pietari. Left to his own devices by his father (Jorma Tommila) in a cold and brutal environment (go inside or you will be eaten by wolves! ), Pietari is both vulnerable and resilient. I loved the way director, Jalmari Helander, builds tension in Rare Exports. The scenes where Pietari discovers his friends have disappeared are genuinely creepy. The capture of what Pietari and his father eventually believe is the real Santa is also pretty intense. This Santa is scary. He is dirty and scrawny and looks like he would eat you up given half a chance. Pietari and his father decide not to give him that chance and they embark on a darkly comic adventure that, in the end, explains the meaning of the film’s title. Rare Exports may take its time to get to the good stuff but it more than rewards your patience. A Christmas classic. 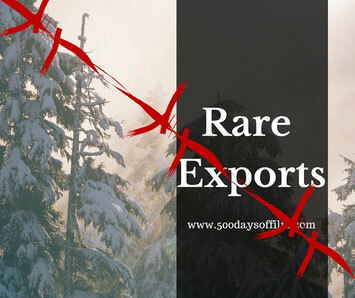 Have you seen Rare Exports? If you have, let me know what you think about this alternative Christmas movie in the comments section below!